In 2011, approximately 13% of the draft class were ultra-Orthodox men who are granted deferments in order to study in yeshiva. These “deferments” are a formalistic legal term that are, in effect, exemptions. 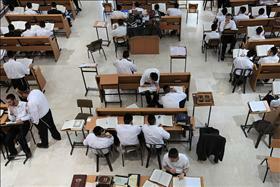 It is estimated that 58,000 yeshiva students of army service age are currently being exempted. This data was published by Shahar Ilan, Vice President for Research and Information of Hiddush – Freedom of Religion & Equality, presented to the special Knesset special meeting on "The Tal Law* – A Year of Decision" which took place on December 7, 2012. The meeting was organized by MK Avi Dichter and the Forum for Equality in Sharing the Civic Burden. Since the establishment of the state, the number of yeshiva students receiving military exemption has increased by nearly 15,000%. This is in contrast to the number of residents in Israel which has increased by only about 1,200%. The rapid growth of ultra-Orthodox participation in the military and civil service seen in 2007-08 has plateaued. The service figures are particularly low given that in 2011 the number of ultra-Orthodox 18 year olds who evaded the draft was 8,500. In 2011 fewer than 2,500 ultra-Orthodox participated in the military (1,200) or civil service (1,300). Compared to 2,020 in 2010, this is a moderate increase of only 21%, and compared to the year before which showed also a modest growth of 17%. In 2008 and 2009, increases were more than one hundred percent. Hiddush President, Adv. Rabbi Uri Regev, said in response that “There is no other topic that enjoys such broad public consensus as the need to stop allowing the mass of yeshiva students from fulfilling their civic duties.” Regev reminded Knesset members that: “Any extension of the Tal Law does a huge disservice to the proud concept of the Peoples’ Army. The public will not tolerate continued discrimination in favor of the ultra-Orthodox; any extension will see great consequences in the next election." Israel’s core democratic principles and commitment to equality are being challenged. The mass exemption of yeshiva students is the most cynical political disregard of public will and national interests. *The Tal Law, named after Justice Tal who chaired the committee that recommended it, was passed in 1999 and was meant to provide a legislated framework to the long standing administrative practice of exempting yeshiva students from military service. It was intended to encourage greater participation in both military and civil service, as well as the workforce. In six months, the law will expire and it is widely held that it failed its purpose and provided for only negligible growth in each of these areas.